CALLING ALL LIVE PERFORMANCE ASSEMBLY GROUPS! MAKE A DIFFERENCE IN THE LIVES OF STUDENTS! Arts Horizons is currently accepting applications for experienced live performance assembly groups to join our roster. Arts Horizons provides students with live performances with skills and knowledge in the arts in accordance with state and local standards. Live performances must be educational, interactive, and engage students in dance, music, or theatre. This call is for live performance assembly groups. Interested teaching artists for in-class residency programs should go to our online artist interest form. 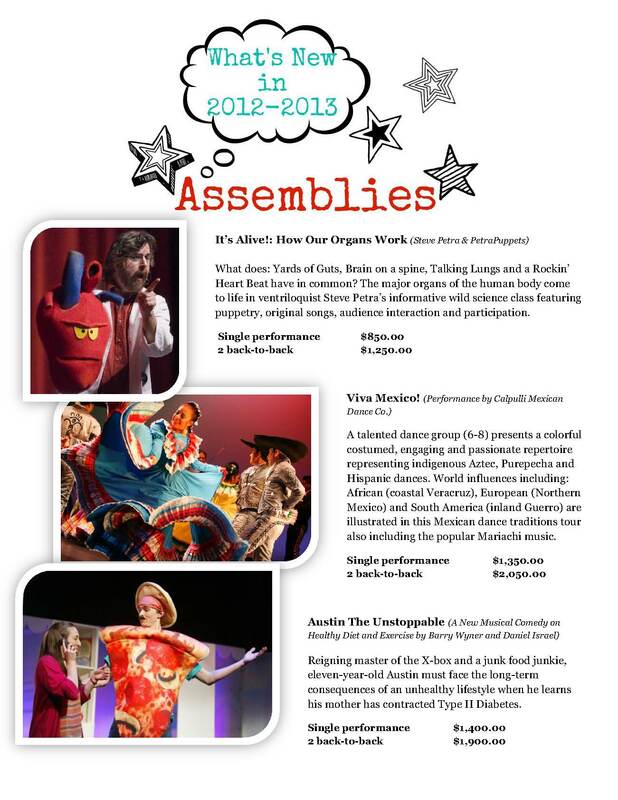 Check out our 2013-14 Digital Program Guide at www.artshorizons.org/brochure. post it to LinkedIn and Pin it on Pintrest. New video option on page 7 lets you see the preview without leaving the brochure!